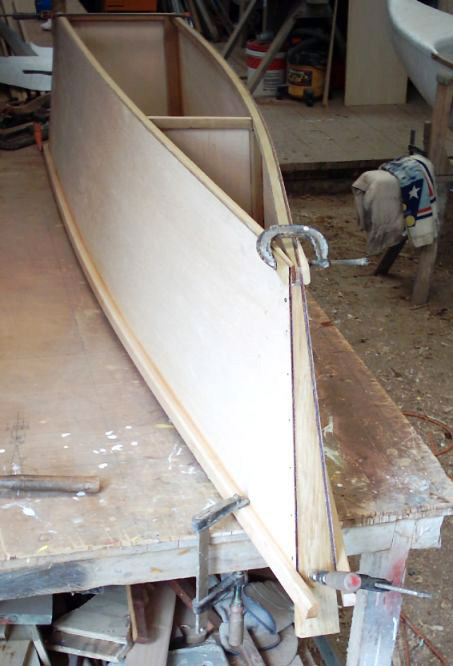 In the late 1800's, when sawn lumber began to appear in Hawaii and other Pacific islands, the local canoe builders immediately saw it as an easier way to build canoes. 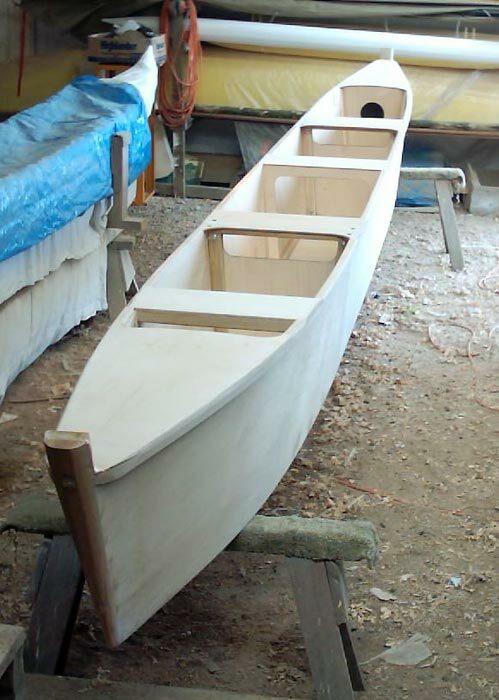 While perhaps slightly less efficient than round bottom shapes they have now become the standard working canoe seen throughout the Pacific. 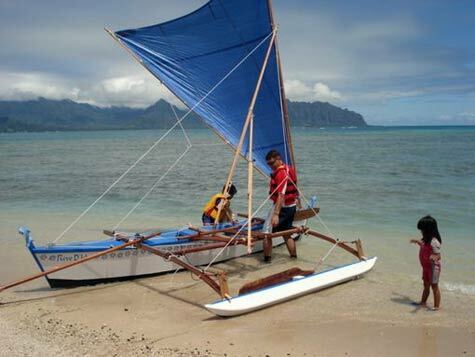 The first models were simply built of three wide planks and came to be known as "three board canoes" or wa'apa in Hawaiian. I built a 16'er in the 70's that unbolted in the center for easier stowage onboard my cruising trimaran. It proved to be a useful dinghy and a fun sailer for exploring. 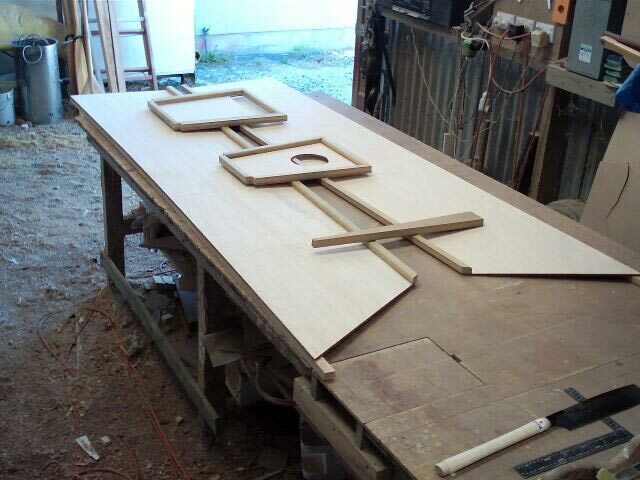 This design is similar in shape but allows for a center section to be added which stretches it to 24'. The 24'er seats four crew, and can be sailed as a tacking outrigger or a shunting proa. The Wa'apa can be built as a one piece hull to save weight, but one of its prime advantages is that no hull or ama section is longer than 2.4 meters (8 ft). It can be built, stored and transported in a small space. The three section main hull and a two piece plywood ama only require six sheets of 6mm (1/4") plywood. 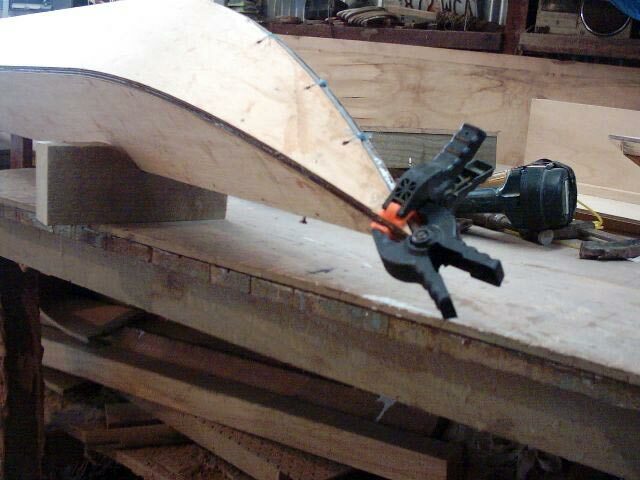 The hull sides and ama can be built with 4mm plywood to save weight. 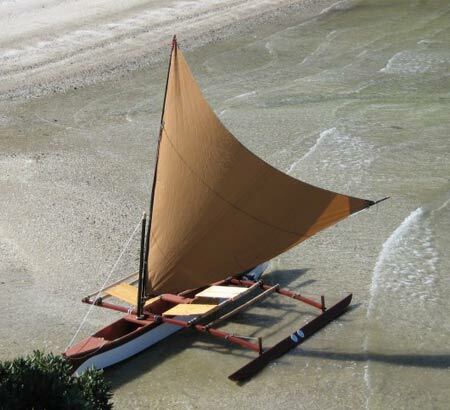 The construction plans for the Wa'apa outrigger canoe include three large sheets containing full size patterns for the bulkheads, stem, and ama panels. All of the construction details and four optional sailplans are printed on additional sheets and are also contained on a CD in the form of PDF files which allow you to zoom in on details. The written building procedure also has additional drawings and is in PDF format. Thirty photographs document the construction of the prototype. Optional stub-mast rig allows greater sail area with a standard windsurf spar. 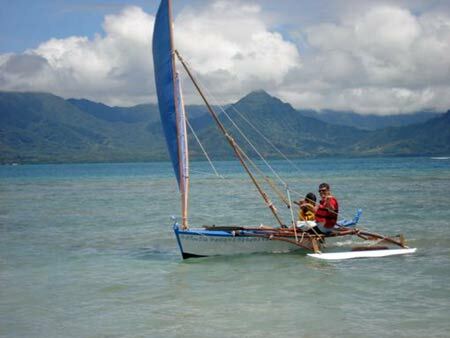 After about 19 months worth of very part time work, I'm happy to say that I've finally "splashed" my Wa'apa outrigger sailing canoe with a sail on it this past Friday (May 18, 2012). With the weather being sunny skies, hovering in the mid 80s temp-wise and winds at 8-10 MPH, it was perfect to be out on the water. I got on the lake about noon and sailed until 4:30PM. Plenty of time to put the boat through its paces. 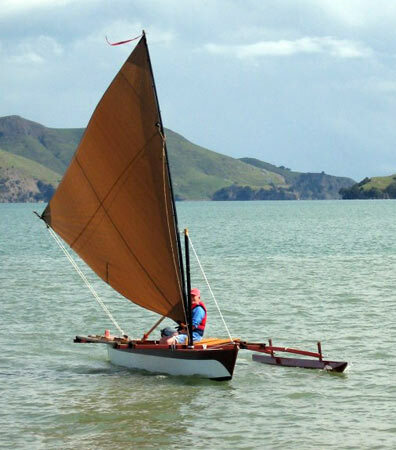 The canoe sailed much faster than I'm used to sailing in my old Elegant Punt (Duckworks Magazine Splash, June 2010). I covered about five times the area of water that I normally do in the dinghy, in the same amount of time. It was great! I had the GPS on my iPhone on for half the day and got up to 6.19 MPH. I'm sure I went faster as I became more comfortable in the boat, later in the day. The wind had also picked up a bit by the time I decided to call it quits. This summer on the water is going to be a blast! Here is a video from my day. Sorry about the quality, but it's hard to film with a camera, sheet line and steering oar in your hands.